I’ve been knitting for many years. I’ve knit intricate lace, cables of all sizes and shapes, ganseys, raglans, Arans, cardigans, vee-necks, socks, mittens, afghans, shawls, hats, scarves, even a Dale of Norway, although it is still awaiting the cutting of the armholes. I’ve done twined knitting and beaded knitting. I don’t use lifelines. I’m a pretty fearless knitter. But one thing I have never done is Fair Isle. For some reason, I am totally intimidated by Fair Isle. I taught myself to to do stranded knitting using two hands. I taught myself to do stranded knitting holding both yarns in my right hand. I’m very comfortable doing stranded knitting. Fair Isle is stranded knitting. So why does it intimidate me so much? Beat’s me. But it does. So, when it was announced on the EZasPi Yahoo Group that Liz Lovick was going to offer a Fair Isle Workshop, I jumped at the chance to learn from an expert. I started out with a Fair Isle sampler. I gathered yarn from my stash, worked out a color scheme using charts from the workshop and my spreadsheet program, Numbers, printed out the charts, and went to work. About half-way through the sampler, I threw my hands up in disgust. My sampler was just horrible. How could someone who knitted a Dale of Norway sweater, the “We Call Them Pirates” hat (and one mitten, to boot), and Selbuvotter mittens, the latter with the exact same yarn that was being used for the sampler, bungle Fair Isle so badly? It just doesn’t make any sense. Back to square one. I decided to can the sampler and work on a beanie. I used the charts Liz provided in the workshop, worked out a color scheme using yarn I had in my stash, inspired by a Fair Isle sweater in Madeline Weston’s book Country Weekend Knits, made the charts in Numbers, and went to work. You can see the results so far in the picture at the beginning of this entry. So far, so good. 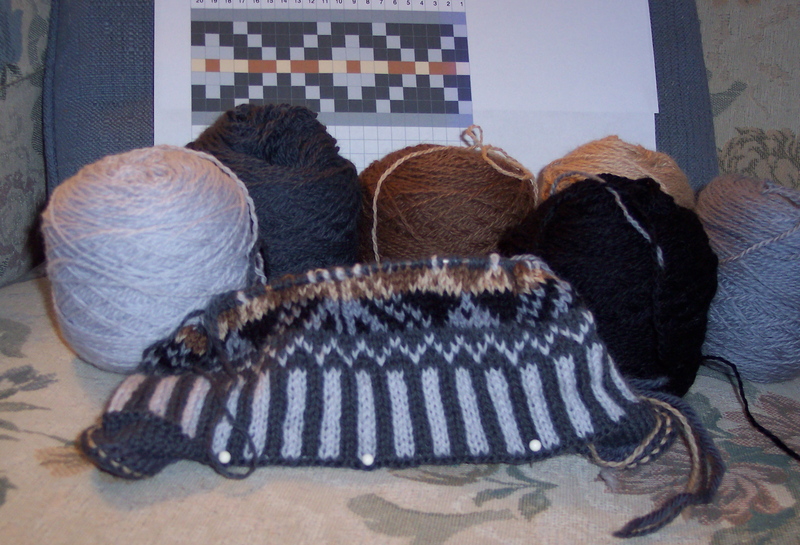 The colors are going together nicely, I think, and my knitting is even and my gauge is holding. I’m half-way through the first OXO motif and I cannot believe how fast it’s going. Heck, I might even finish this. Dare I think that I am actually starting to be the kicker rather than the kickee? Stay tuned.